1) 100% Cotton Labels: These great 100% Cotton - finest Egyptian cotton labels really make your products stand out; the minimum is only 20 labels! 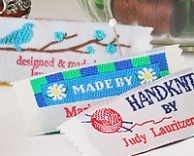 2) Personalized Woven Labels With Borders: Your woven labels with borders can be personalized! Your choice of borders really makes your product stand out. A low 50 labels minimum. 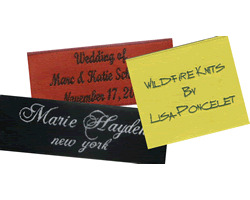 3) Personalized Fabric Clothing Labels: These personalized woven fabric labels will give your line that special touch. Put your logo on here and customize the text! Only 50 labels minimum. Put yourself in control of your brand! 4) Custom Sew In Cloth Tags and Labels - 50+ labels: Your custom sew in cloth tags and labels are perfect for a boutique line. 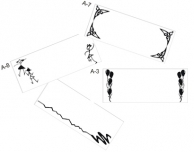 These labels put that zing in your product; a real value! 5) Personalized Woven Fabric Clothing Labels with Design: Your pre-designed woven fabric clothing labels are fully customizable. 100 labels minimum. And the most affordable!